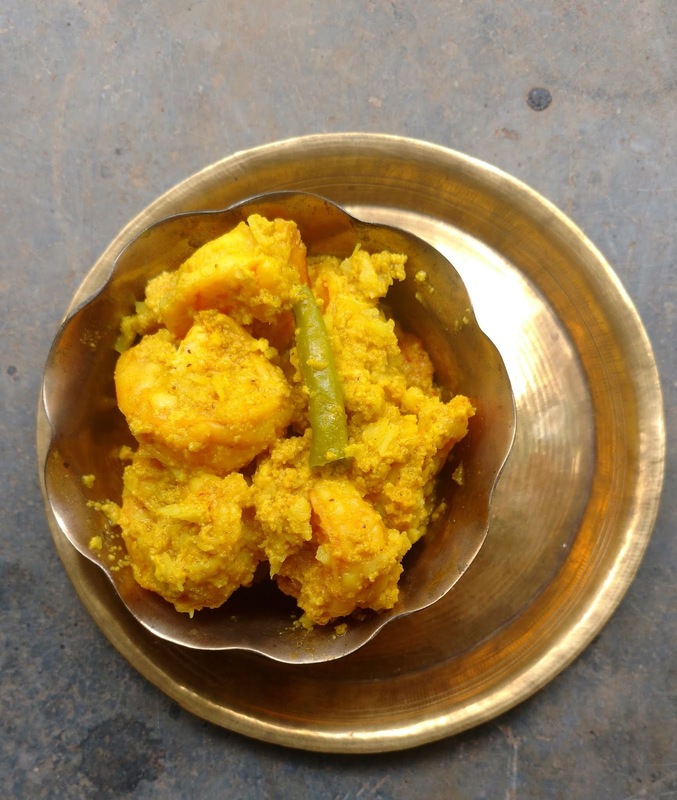 As my journey of exploration into Bengali cuisine continues I'm impressed again and again at the sheer simplicity of most of the recipes be they simple everyday dishes or quite often, dishes one would serve as a treat on a special day. The list of ingredients is frugal and the method quite simple. In fact it's often made me wonder if the recipe would actually work. But of course my doubts have evaporated every time I'm put my faith in the recipe and simply given it a try. Yesterday I was meeting friends for a potluck lunch. I volunteered to make some Bengali dishes among which was Chingri Bhaape, which, translated literally, means steamed prawns. As I read through the recipe in the numerous Bengali recipe books I'm cooking my way through I was hooked. All you had to do was mix all the ingredients with the prawns and steam the whole thing. That's it. I'm a great fan of quick, no fuss recipes and I couldn't wait to try it out. The results, I must say, were excellent and Chingri Bhaape is going to feature on my menus quite often, that's for sure! Soak poppy seeds for around 30 minutes, drain and then grind to a smooth paste. I added a couple of green chillies (not the very pungent ones) just for added flavour while making this paste. Soak mustard seeds for 30 minutes, drain and make a paste. You can grind the mustard along with the poppy seeds. I like to keep it separate in case the mustard paste turns bitter. In a pinch I use Sunrise mustard powder which I get easily (touch wood!) from my local fish shop. This powder also needs to be soaked before use. You can keep the tails on the prawns if you like. I remove everything as the husband has a shell allergy. Marinate the prawns in salt and turmeric while the poppy seeds and mustard is soaking. Once the prep is done you're ready to go. Take a steel box or dabba with a close fitting lid that's large enough to hold all the prawns leaving enough room. In the box put in the prawns and all the ingredients barring the green chillies and mustard oil. Give it all a good mix. Pour the mustard oil over the prawns and place the green chillies on top. Shut the box. In a cooker or large vessel (one in which the box will fit) with a lid put water to heat. Place the box in this water. The box should sit in the water but shouldn't get submerged and water shouldn't get into the box. If you're using a pressure cooker put the lid on without the whistle. If you're using a regular vessel put on the lid. Once the water starts boiling lower the heat and let the box of prawns steam for a good 15- 20 minutes undisturbed. Put a weight on the lid to keep the steam in. Alternatively, you can also cook the prawns directly on a VERY LOW flame directly in a kadai or wok. Just remember to leave it alone so that the steam generated stays in and the prawns and the pastes cook properly. Keep an eye on the gas flame - since it's kept very low it might go off and you don't want any accidents thanks to leaking gas. Serve the Chingri Bhaape with plain hot rice. Rhea, do you steam them with the lid on? I ask because I have a steamer and don't know if I need to still put them in a box or just in a steel bartan with the steamer lid on. Parvana - yes, steam with the lid on. You can't put the prawns directly in the steamer as the marinade will drip through. The lid keeps the steam generated from the water from the pastes and prawns in, and the prawns cook in that steam. Thanks Rhea, but if I put it in a small steel handi into the steamer, do I still need to cover it. I rarely put anything directly in the steamer basket, only in another vessel. I have my mom's old fashioned aluminum steamer, one big handi below and one perforated one that fits on top of it with a lid on that. Yes, you will need a lid. Steam from the steamer will make the dish watery which we don't want.